Wow guys - I am off to a terrible start with being "back in action" for Becca Bakes. But hear me out - there's some very legitimate reasons for this. First and foremost, I was gone the entire month of May on vacation in Japan. It was INCREDIBLE and Japanese desserts are pretty wild. Some of my favorites were hot and fresh tofu donuts from the Nishiki Market in Kyoto and fluffy souffle pancakes from Bill's Pancakes in Harajuku. Lowkey my favorite sweets were all from 7-11 though!! We brought an entire suitcase (not an exaggeration) back full of sweets for friends and family. Click here to see a full list of recommendations for the trip. Now that brings us to our very-not-as-much-fun second reason I've been slacking on the baking... my oven. We moved into a new place in December and ever baker knows you need to develop your relationship with your oven so you know exactly all of it's quirks. I was baking here and there and noticing that nothing was coming out quite right. First line of defense is always getting an oven thermometer as a third-party validator to your troubles and I noticed two things (1) when my oven said it was pre-heated to 350 degrees it was actually at 250 degrees (wtf??) and (2) even when I let it warm up past the "ready time" it never actually got to 350 degrees. In the end, I was baking everything unknowingly roughly 25-30 degrees below where it should be. I had accepted my fate and tried to work around this, preheating the oven to 375 so it would actually end up at 350, but it wasn't really working either. After a failed attempt at my FAIL SAFE chocolate chip cookies, I was at my wits end. I googled and found out that oven calibration is a thing and excitedly got on my hands and knees to find my oven's model number. Turns out calibrating your oven is EXTREMELY EASY and I was able to adjust it. These Honey Roasted Peanut Butter Cookies are my first attempt with a properly calibrated oven and I was basically dancing through the house with excitement when they worked!! In conclusion, with a working oven, I'm ready to get back at it! These Honey Roasted Peanut Butter Cookies were fun to make. My favorite part was that you pulse honey roasted peanuts up with flour to make a chunky "peanut flour" that is added to the dough at the end. The recipe calls for 16 minutes at 350 degrees, but I lowered to 14 minutes at 350 degrees for a bit of a chewier texture. 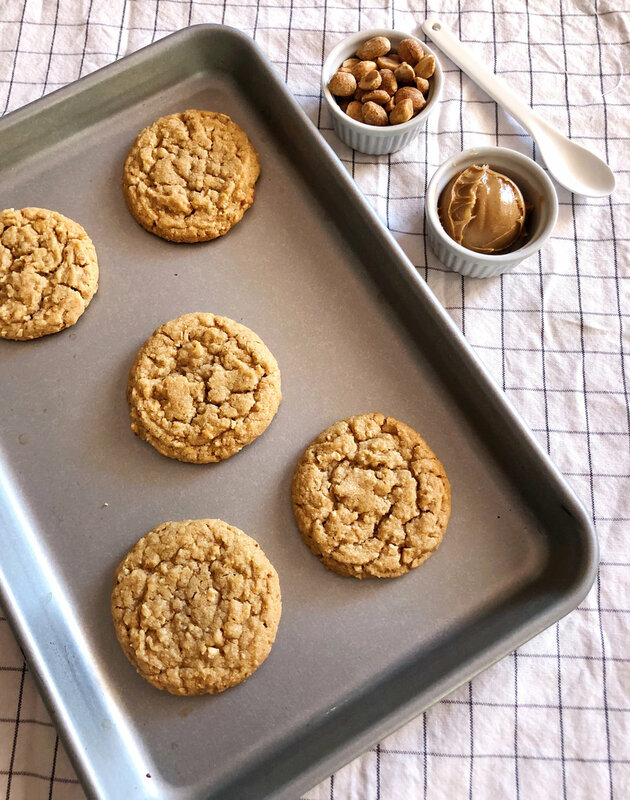 If you like peanut butter cookies, adding the honey roasted peanuts is a nice twist!